I am only 28 but I am already thinking about retirement. Why?? Because I want to retire comfortably, I want to be able to travel and take my kids and grand-kids on cruises. In order to do this I need to have a plan. A big part of my plan is taking advantage of Roth Investments which will allow me to take out my money tax free. If I invest 1 million dollars over my lifetime and it grows to 3 million dollars, it means I get to keep every cent of the 3 million dollars. I don't have to pay anything to taxes. Most people can contribute to a Roth-IRA. There are some exclusions like if you make too much money. You can contribute up to $5,500 dollars per year. When you hit 60 years old and retire you get to withdraw the money tax free. Active Duty Military members and other government employees can also contribute to a similar account called a Roth-TSP. The government rolled out this plan in 2012.
Who can contribute to a Roth-TSP? How do I contribute to a Roth-TSP? 2.) 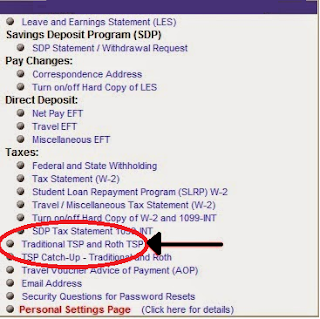 Click on the "Traditional TSP and Roth TSP" link. 3.) Enter the percentage of your basic, special, incentive, and bonus pay that you want to contribute. 4.) Press submit and you're done! What type of funds can I put my money into? If you are young like me I would recommend putting most if not all your money into stock funds. There is more risk with doing this but down the road you will likely have gained alot more money. Why do I think the Roth-TSP is such a good idea? I love how low the expense ratios are. The expense ratio for all 6 funds is about 0.03%. This means you are paying $0.03 cents for every $100 they manage or $3 for every $10k they manage. This is the lowest expense ratio around. Vanguard which is know for its low expense ratios has its lowest fund at 0.05%. So the government is getting you a good deal in regards to expense ratio. You can contribute to both the Roth-IRA and the Roth-TSP. Between the Roth-IRA($5500) and the Roth-TSP($18000), you can contribute up to $23,500 a year into a tax-free retirement account! If you are married I would max out your wifes Roth-IRA as well and make it $29,000. "As an Army Reservist, I have found the TSP Program a great chance to build another 401K retirement fund. The rate of return on their funds tends to outperform many comparable funds and I don't even notice the deductions as they are automatically taken out of my LES." "In my opinion, you should be maximizing your Roth TSP and regular Roth before doing anything else financially. Nothing else will maximize your returns long-term as much as this"
I also plan to continue to try out other non-Roth investment opportunities that offer bonus sign up offers or good rates. I would max out your Roth IRA and Roth TSP before doing other investments though. I am maxing out those so thats why I am doing other things in addition. Here are some I am currently using. $5000 - Navy Federal CD (about once a year they offer a 5% CD rate for 1 year). Right now the rate is only 3.5%. $8000 - Robinhood. This is an app that lets you trade with no fees. I have money in Disney, Under Armour, Amazon, and U-Hual. $3000 - TradeKing. They have provided me with a $100 sign up bonus for our readers. In order to get bonus, you have to make 3 trades. Each trade costs $4.95. So after trades you basically get a $85 bonus. Email me at contact@discounts-deals4military.com and I can send you a link for the bonus. $1000 - Motif Investing. They have a $150 bonus. In order to get bonus you have to make five trades. Each trade costs $9.95. So after trades you basically get a $100 bonus. They also have another bonus for $100 after just making 1 trade which is a free $90. If you want that link email me at contact@discounts-deals4military.com and I can send you it. If you have more questions about the Roth-TSP visit the official Roth-TSP website. Awesome article and even better strategy. I didn't know about maxing out the Roth-TSP AND the regular Roth. Thanks for the tips! I waited until the Roth TSP became available before I started investing in it. I missed 2 years of investing in the Traditional TSP and I'm kicking myself! The 2010-2012 market was a real bargain compared to today. Nice article, don't forget that you can contribute to your spouse's Roth IRA as well if your married filing jointly, even if they don't have income. That's $29,000 a year in tax advantaged retirement investments annually.